When considering where to live, Home buyers looking to plant roots in the suburbs might want to consider Huntley, Illinois which has been named the No. 1 place in Illinois for home ownership by Consumer Finance website. The Village of Huntley, founded in 1851, is a rapidly growing community located in southern McHenry County and northern Kane County. Huntley is bisected by Illinois Route 47 north and south, the Union Pacific Railroad northwest and southeast, and bordered on the south by Interstate 90. The Blackhawk Wars of 1834 resulted in terms that sent the first inhabitants of the area, Native Americans, to Iowa, thereby opening up the land to its first white settlers. McHenry County was established in n1837, and in 1838 the first settlers, mostly from New England, came to Grafton Township. One of these families, Prescott and Lucy Geer Whittemore, of Grafton, New Hampshire, settled west of the future town. Thomas Stillwell and Eliza Fox Huntley and children, Charles, Harriet, nand William arrived in 1846. The Huntleys acquired land north of the future village and later expanded their holdings to the south. The Chicago and Galena Railroad constructed a railroad in 1851, which reached as far northwest as Huntley's Grove. The railroad owners hosted an excursion trip on September 5,1851, which marked the maiden voyage,to Huntley's Station, and that was the beginning of Huntley (the n"Grove" and "Station" words were later dropped). The Chicago Tribune article that described the 1851 excursion trip stated that there were a few frame houses near the railroad and Mr. Huntley soon built a general store there as well. Procurement of land was based on government grants. Louise Kreutzer, an Huntley native, tells of land regularly changing hands due to settlers'n inability to make mortgage payments and wealthy landowners being quick to foreclose. Despite early hardships, the village grew slowly and steadily. Stewart Cummings was the first postmaster in 1851 and when then village was incorporated in 1872, John S. Cummings, a Civil War veteran became the first mayor. The Chicago and Galena Railroad became the Chicago and Northwestern nRailroad, and later, Union Pacific Railroad, and served the community for over 150 years, though passenger service was eliminated in about n1950. 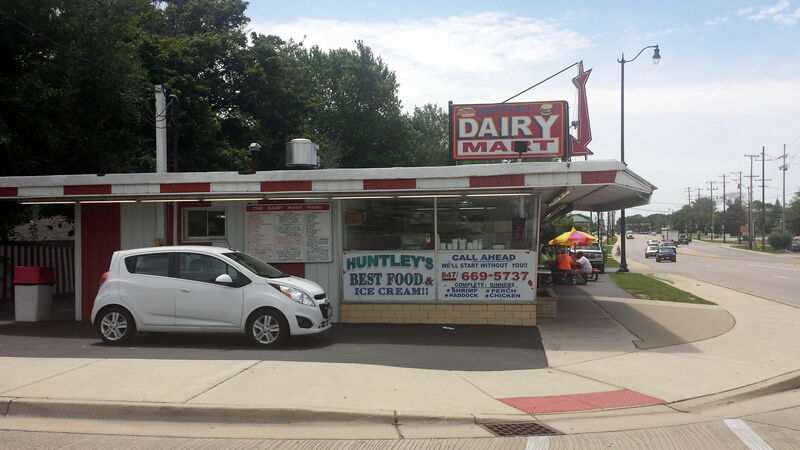 The railroad was critical to the economic development of Huntley because it provided the means of sending agriculture products to the nChicago market and led to Huntley's preeminence as a dairy center. In addition to shipping dairy products directly to Chicago, milk producers sold milk to local factories, which processed condensed milk, butter and cheese. There is a strong possibility that passenger train service will be reinstated in the future. 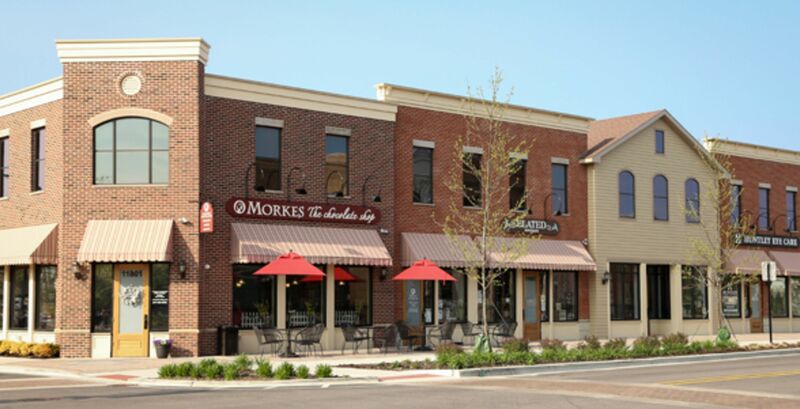 The town center was a thriving locale with a variety of retail and service businesses. In 1906 the Elgin and Belvidere Electric Railroad constructed a system linking the two larger cities with all the communities between and provided hourly passenger service in each direction. When more roads were paved and automobiles became prevalent, the use of the electric railroad diminished, and it closed in 1930. When Huntley was platted in 1853, land was set aside in the center of town for a town park. Maps as early as 1872 show the area as open space. A wooden pump stood in the center of the park serving as a water supply for both horses and firefighting. With Huntley's development as an dairy center, horses were tied to the hitching rail surrounding the park every morning while farmers visited stores after delivering their milk cans at the railroad or factory. On milk contract signing days, then four sides of the park were thickly clustered with horses and wagons. nThe park was and is an object of pride to the residents. A band shell stood near the center of the park where the brass band performed patriotic music before some of the members marched off to the Civil War.n After WWI, Andrew Schmitt, a stonemason, was commissioned by the Huntley Women's Club to set a stone as a memorial for those who served in the war. He also set a small cannon on a rock base as a memorial. 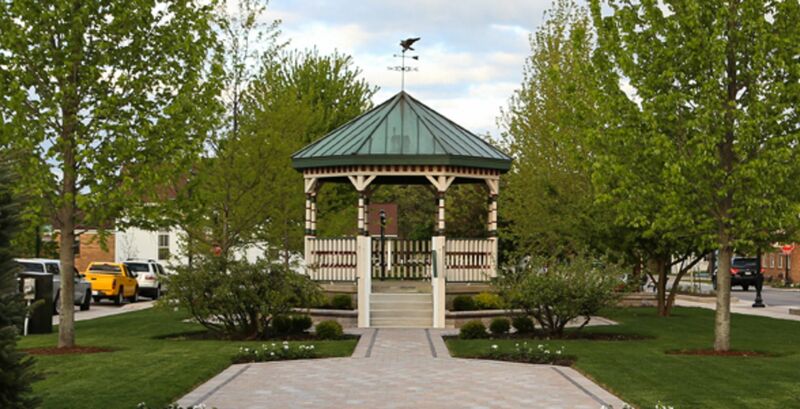 A new gazebo replaced the band shell in the 1990s and is surrounded by trees and shrubs and beautiful flowerbeds. A memorial brick sidewalk marking Huntley's Sesquicentennial surrounds the gazebo, where a time capsule marking the event is buried. The square was named James Dhamer Park in memory of the 14 year mayor after his death in 1999. Thomas Huntley also was responsible for reserving land in the town plat for churches. The three oldest existing parishes built churches on the land he donated, the first being the Congregational Church, which began meeting in 1852, the second, Trinity Lutheran in 1871, and the third, St. Mary Catholic in 1873. Throughout Huntley's existence many area people subscribed to the Elgin Courier News or the Woodstock nSentinel. Several local newspapers have been published in the village, the first being Huntley News, in the 1890's, The Huntley Journal in the nearly 1900's, the Huntley Review published by John Brill in the 1930s and 40s, and beginning in 1960 and still in existence, the Huntley Farmside, first owned and published by Dennis Quin O'Brien. Population of the village grew and fluctuated but never rose above 650 until the latter half of the 20th Century. Almost no growth occurred during the Depression years, but the village began to grow slowly and steadily after WWII. In 1993, Prime Development proposed a planned community of 2,700 acres south of the village near the Northwest nTollway. Huntley annexed the property, and Prime built a shopping outlet mall and added auto dealerships and several commercial and industrial parks. 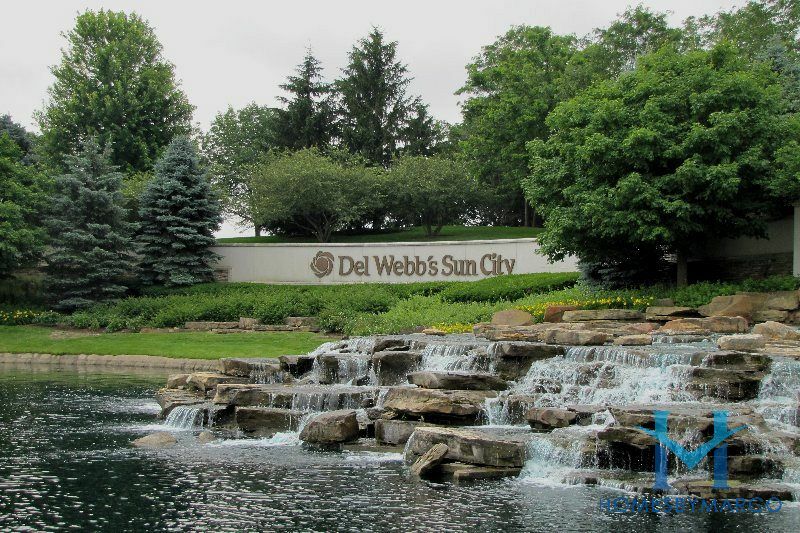 Prime sold the portion planned for residential use to Del Webb nSun City. Sun City is an age-restricted community for 55 year-olds and over. Residents began occupying homes in 1999 and continue to acquire property there at a steady rate. Real estate developments have flourished to the east and northeast so that the population continues ton increase rapidly. This has necessitated the building of eight new schools since 1995. 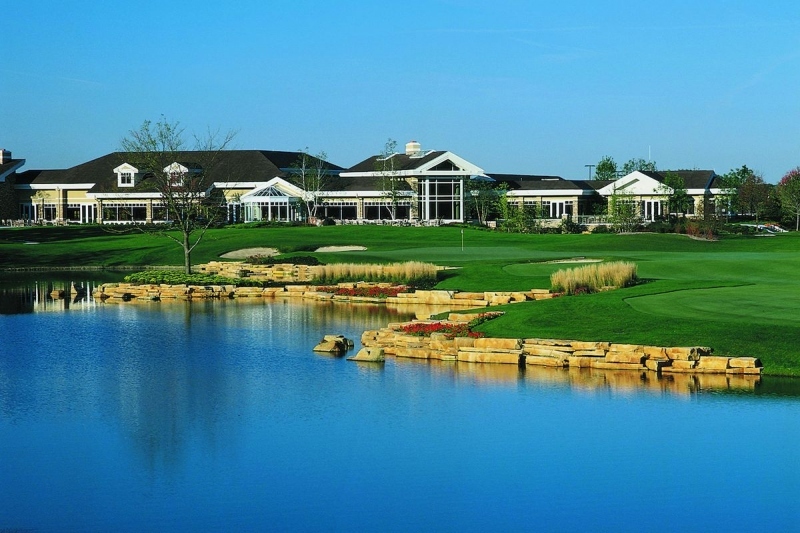 Del Webb's Sun City Huntley in Illinois is one of the premier active adult communities in the Chicago area. 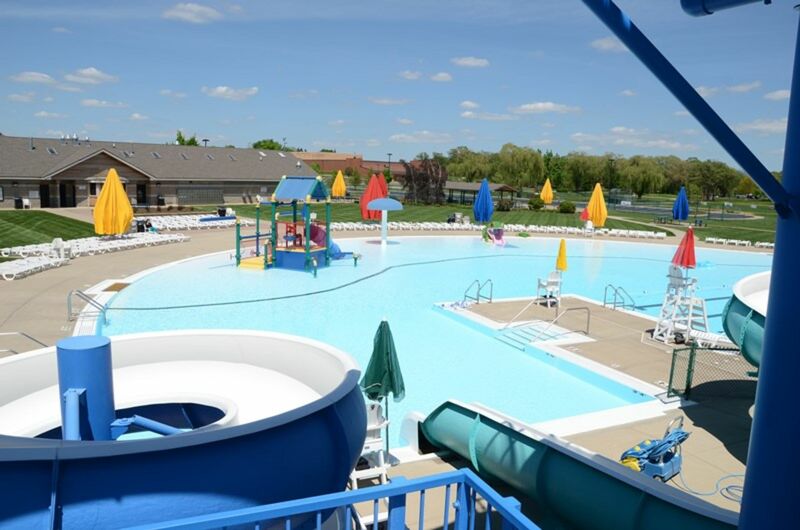 With over 5,400 homes spread across 2,300 acres, Sun City Huntley is the largest and most amenity-laden 55+ community in the entire Midwest offering a lifestyle unrivaled by any community in the area.